No one ever said that clowns had to wear those fluffy jumpsuits. Did they? We're pretty sure they didn't. We're also pretty sure you aren't required to wear ridiculously large shoes if you don't want to. That's the beauty of dressing as a clown! You get to interpret your outfit however you like. It's your own creation after all, so your clown can be in pastels, or have a giant tutu, or even a massive hat. So the question is, what do you want your clown character to look like? If it were us, we'd go with some classic colors. Bright primary colors with polka dots or stripes. And if it were us, we'd avoid the full clown jumpsuit in lieu of something more comfortable. Maybe a dress or skirt? 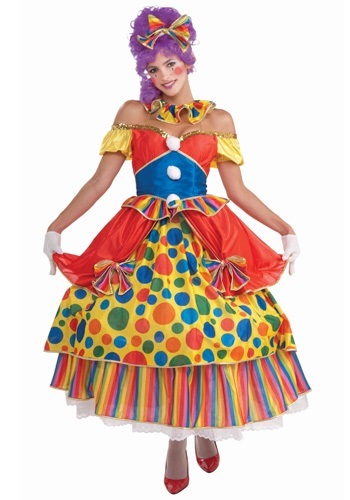 We'd definitely avoid big hands/feet, and go for something both clown-like but cute. Essentially, we'd be after this Big Top Belle Clown Costume. It's a brightly colored polyester dress in all colors of the rainbow. There's yellow off-the-shoulder sleeves, different layers to the skirts (both stripes and polka dots), and a hoop skirt to give the dress volume. There's rainbow trim, gold sequin bands, a polka-dot collar, and even a red bowed headband to top it off. This outfit is both bright and cheery, but adorable, which we think is a win-win. Not to mention no jumpsuit! That's even better. Costume is well worth the cost. Only issue was the elastic on sleeves very tight. I cut the elastic on the underneath to release the tension. Purchased the purple wig and everybody loved it.